Rugged, lightweight Edge attaches easily to the stem or handlebars of your bike with the included bike mount. Just turn it on, acquire GPS satellites and go. Edge 305 automatically measures your speed, distance, time, calories burned, altitude, climb and descent, and also records the route you have taken for review. For extra-precise climb and descent data, Edge 305 also incorporates a barometric altimeter to pinpoint changes in elevation. Easy to install; no calibration required. Just snap it into the bike mount and go. High-sensitivity GPS receiver tracks your position even in tree cover and canyons, making it extremely reliable for location, distance and speed information. 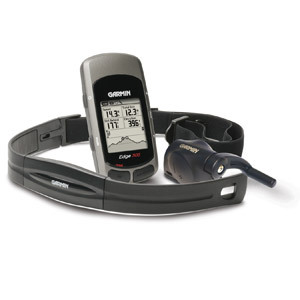 Edge 305 comes packaged with a heart rate monitor, speed/cadence sensor, or both. These wireless sensors use ANT+™ technology to send valuable workout data to the Edge. Edge 305 + heart rate — measure your heart rate and track your heart rate zone with the lightweight, comfortable heart rate strap. Don't worry about cross-talk; ANT+™ technology eliminates interference from other heart rate monitors. Edge 305 + cadence — monitor your pedaling cadence and wheel speed as you ride with the self-calibrating, wireless speed/cadence sensor that attaches securely to your bike. You can even use it to train indoors because the sensor attaches to your rear wheel. As an added benefit, you can plan, analyse and store data from your workouts using free Garmin Training Center® software, which lets you analyse data with interactive graphs that chart your speed, time, heart rate and elevation. Overlay your ride on a map so you can pinpoint specific areas and see how elevation and other factors affect your performance. Or, upload your workout data to MotionBased.com, Garmin's web-based application that provides in-depth analysis of your workouts, online mapping and route sharing that will take your training to the next level. Endurance athletes can also use the Edge with TrainingPeaks.com, an easy-to-use web-based training system designed to help athletes train for any event.